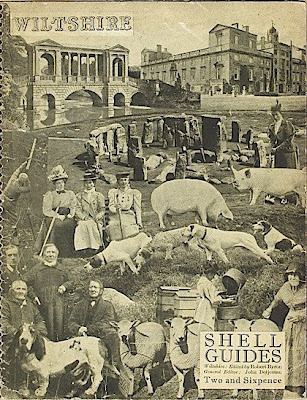 Shell Guides are now so fashionable, so collected, that last year Middlesex University ran an exhibition on them at the MODA, near Cockfosters. . Naturally, as a Shell Guide writer myself , (Hertfordshire of 1982, if you must know ) I made a special effort to see it, despite the fact that I was a little miffed that no-one had asked me to take part in the planned symposium organised by the show’s curator, ‘ cultural historian ‘ David Heathcote. It was a well put together show by someone who is clearly passionate about the Guides. He has talked about them on Radio 4 and is now doing a book . While I was looking for mistakes on the captions I saw a woman poring over one of the books generously supplied by the Museum for those not familiar with the Guides and their context. She had come from Thornton Heath or somewhere especially to see the exhibition and seemed impressed when I pointed out my own Guide in the case—but spoiled the mood when she admitted to also liking those horrible King’s England books with their revolting sepia photographs. I tried to convince her of the Guides’ superiority over any county guide that had appeared before or since, and then realised that I was in danger of getting pompous, so I shut up. The Shell Guides are rightly revered and are obvious candidates for academic interest. Can you imagine any academic institution celebrating King’s England or those Edwardian Ward Lock Guides with their endless pages of ads for hotels and thermal spas ? I suppose Pevsner’s Buildings of England will be the next focus for another ‘ cultural historian ‘, possibly from the University of East Croydon. 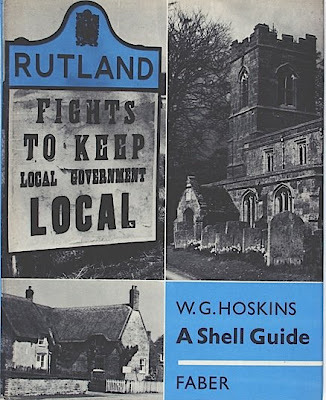 A whole book, Stylistic Cold Wars, has been written on the rivalry between the Shell Guides and The Buildings of England, and a very silly book it is too. The Guides have many celebrated admirers today. One is Richard Ingrams, who is a fan of both Betjeman and John Piper —another the magnificent Jonathan Meades, champion of the even greater Ian Nairn. Both were happy to show me their collections when I interviewed them. I don't know about "academic", but Ward Lock's Red Guides have a substantial following on the intertubes -- http://www.wardlockredguides.co.uk/ for instance. Thank you for these articles; I've never heard of these older Shell Guides, only being familiar with the later New Shell Guides, which I don't much like. She Who Keeps The Household Budget is not going to be quite so pleased as I am to hear about them.